For my car series I don’t like streets with even the slightest bit of a grade to them but I made an exception here. 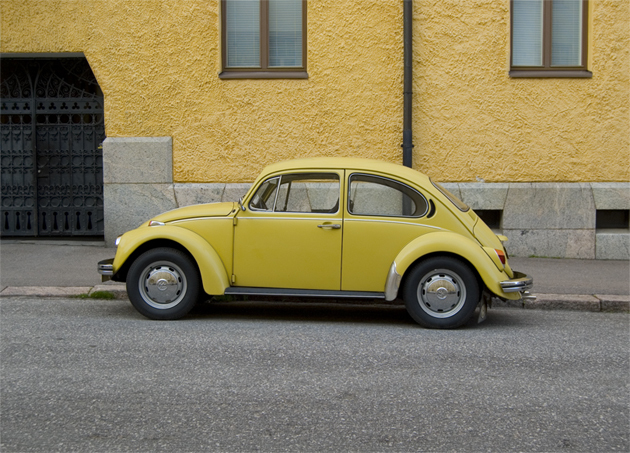 I couldn’t pass up this late 60’s VW Beetle against that yellow background. Note the optional mudflaps and fender splash guards for protecting the finish from the harsh winter rain and snow. I noticed that the Finns like to paint their buildings in warm tones to remind them of the sun. It’s a nice touch that you immediately notice walking around the city. I visited Helsinki during their warmer months and loved it but I can’t imagine what its like during the winter with extreme temperature drops and a handful of daylight hours. No wonder bears hibernate. For a look at what Helsinki looks like during the winter (of 1966-67) check out the Michael Caine film Billion Dollar Brain. Helsinki is also used as the location for many films set during the Cold War-era and doubled for Moscow in Gorky Park. Finnish Lesson #1: The street signs in Helsinki (and most other signage) can get quite confusing because they display the names in both Finnish and Swedish. One street was marked Johanneksenrinne/Johanneksentie/Johannesvägen. Quite amusing. I’m sure Johann (John) is happy though.